(HARLINGEN) – Mechatronics Technology students at Texas State Technical College will soon have labs equipped with two robotic arms to program and maintain as part of their hands-on training, all thanks to Toyota. The donated robotic arms have been used to build more than two million Toyota Tundras and Tacomas over the last 10 years. 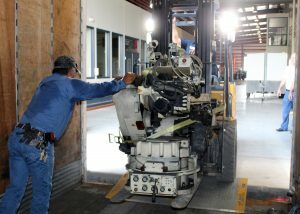 Toyota Human Resources Manpower Planning Specialist Albert Escamilla, who assisted in organizing the donation with TSTC, said the robots reached their lifespan at Toyota and were replaced with updated versions. Escamilla also added that Toyota recruits from TSTC statewide, but has hired more graduates from TSTC in Harlingen than any other campus. “After learning on larger more versatile robots like these, students will graduate better prepared to enter the workforce,” said Escamilla. Leija noted that the robots will be ready to use as early as Spring 2019, after installation and instructor training. All training for the robotic arms will be provided by Toyota and will mirror the automotive manufacturer’s employee training. “We are so thankful to Toyota, not only for the donation, but also for the training,” said Leija. While there is still work to be done in terms of installation and training, Leija said the hardest part of the process is over. “This has been months in the making and although we still have a ways to go, the hardest part: pickup and delivery, is complete,” he said. The pickup and delivery was organized and managed by TSTC’s Continuing Education Commercial Driver’s License instructor Juan Hernandez and Transportation Training Center Coordinator Adan Trevino. “By using our own semi-trucks for this occasion and not outsourcing we not only saved the college more than $5,000, but we also had the opportunity to promote our program,” said Trevino. “Our trucks are wrapped in TSTC branding and traveled through major cities like Kingsville, Corpus Christi and of course our final destination: San Antonio,” he added. Leija said him and his Mechatronics Technology team have a lot of people to be grateful for in making this donation possible for the program and its students. For more information on Mechatronics Technology and other programs offered at TSTC, visit tstc.edu.